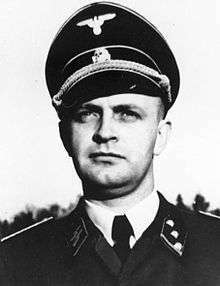 Heinz Linge (23 March 1913 – 9 March 1980) was an SS officer who served as a valet for German dictator Adolf Hitler. Linge was present in the Führerbunker on 30 April 1945, when Hitler shot himself. Linge was born in Bremen, Germany. He was employed as a bricklayer prior to joining the SS in 1933. He served in the Leibstandarte SS Adolf Hitler (LSSAH), Hitler's bodyguard. In 1934 when he was part of No. 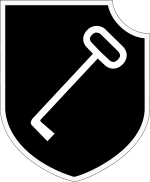 1 Guard to Hitler's residence on the Obersalzberg near Berchtesgaden, Linge was selected to serve at the Reich Chancellery. By the end of the war he had obtained the rank of SS-Obersturmbannführer (lieutenant colonel). On 24 January 1935, Linge was chosen to be a valet for Hitler. He was one of three valets at that time. In September 1939, Linge replaced Karl Wilhelm Krause as chief valet for Hitler. Linge worked as a valet in the Reich Chancellery in Berlin, at Hitler's residence near Berchtesgaden, and at Wolfsschanze in Rastenburg. He stated that his daily routine was to wake Hitler each day at 11.00am and provide morning newspapers and messages. Linge would then keep him stocked with writing materials and spectacles for his morning reading session in bed. Hitler would then dress himself to a stopwatch with Linge acting as a "referee". He would take a light breakfast of tea, biscuits and an apple and a vegetarian lunch at 2.30pm. Dinner with only a few guests present was at 8.00pm. As Hitler's valet, Linge was also a member of the Führerbegleitkommando which provided personal security protection for Hitler. By 1944, he was also head of Hitler's personal service staff. Besides accompanying Hitler on all his travels, he was responsible for the accommodations; all the servants, mess orderlies, cooks, caterers and maids were "subordinate" to Linge. Linge was one of many soldiers, servants, secretaries, and officers who moved into the Reich Chancellery and Führerbunker in Berlin in 1945. There he continued as Hitler's chief valet and protocol officer and was one of those who closely witnessed the last days of Hitler's life during the Battle of Berlin. He was also Hitler's personal ordinance officer. Linge delivered messages to Hitler and escorted people in to meet with Hitler. In addition, after Hitler's personal physician Theodor Morell left Berlin on 23 April, Linge and Dr. Werner Haase administered to Hitler the prepared medicine which had been left behind. Two days before his suicide on 30 April with Eva Braun, Hitler had confided his suicide plan to Linge. He asked Linge to have their bodies wrapped in blankets and taken up to the garden to be cremated. Following his marriage to Eva, Hitler spent the last night of his life lying awake and fully clothed on his bed. On 30 April, Hitler had a last midday meal with his secretaries. After the meal, Linge spoke briefly with Eva Braun. He described her as looking pale and of having little sleep. She thanked him for his service. Hitler then said farewell to each of his servants and subordinates. Thereafter, Hitler retired to his study at 3:15 p.m. There, Linge privately asked Hitler his orders. Hitler stated, he was going to shoot himself and Linge knew what he had to do. Further, he had given the order to break-out. Linge was to join one of the groups and try to get to the west. Linge asked Hitler for what they should now fight. Hitler replied, "For the coming man". Linge then saluted and left. In the 1974 video documentary The Two Deaths of Adolf Hitler, part of The World at War collection, Linge, along with Hitler's secretary, Traudl Junge, narrates Hitler's very last minutes in the bunker. Linge explains that Hitler and his wife committed suicide in Hitler's private room in the bunker. He tells how he went into Hitler's private study after hearing a sudden bang and found both Hitler and Eva Braun dead. After the suicide of Hitler and Eva Braun, the two bodies were carried up the stairs to ground level and through the bunker's emergency exit to the garden behind the Reich Chancellery, where they were doused with petrol. After the first attempts to ignite the petrol did not work, Linge went back inside the bunker and returned with a thick roll of papers. Martin Bormann lit the papers and threw the torch onto the bodies. As the two corpses caught fire, a small group, including Bormann, Linge, Otto Günsche, Joseph Goebbels, Erich Kempka, Peter Högl, Ewald Lindloff, and Hans Reisser, raised their arms in salute as they stood just inside the bunker doorway. Thus attempting to keep Hitler’s corpse from being captured by the Soviet Red Army as the Führer had commanded. At around 16:15, Linge ordered SS-Untersturmführer Heinz Krüger and SS-Oberscharführer Werner Schwiedel to roll up the rug in Hitler's study to burn it. The two men removed the blood-stained rug, carried it up the stairs and outside to the Chancellery garden. There the rug was placed on the ground and burned. On and off during the afternoon, the Soviets shelled the area in and around the Reich Chancellery. SS guards brought over additional cans of petrol to further burn the corpses. Linge later noted the fire did not completely destroy the remains, as the corpses were being burned in the open, where the distribution of heat varies. The burning of the corpses lasted from 16:00 to 18:30. The remains were covered up in a shallow bomb crater at around 18:30 by Lindloff and Reisser. Linge was one of the last to leave the Führerbunker in the early morning hours of 1 May 1945. He teamed up with SS-Obersturmbannführer Erich Kempka. Linge was later captured near See-Strasse. On 2 May, the badly burned remains of Hitler, Braun, and two dogs (thought to be Blondi and her offspring Wulf) were discovered in a shell crater by a unit of SMERSH. On 5 May, they secretly removed the remains. According to Ian Kershaw the corpses of Braun and Hitler were fully burned when the Red Army found them, and only a lower jaw with dental work could be identified as Hitler's remains. Several days later, after his identity was revealed, two Soviet officers escorted Linge by train to Moscow where he was thrown into the notorious Lubjanka Prison. Linge spent ten years in Soviet captivity and was released in 1955. During the imprisonment, Linge and Günsche were interrogated by Soviet NKVD (later superseded by the MVD, separate from the agency of the KGB, formed in 1954) officers about the circumstances of Hitler's death. A dossier was edited by Soviet NKVD officers and presented to Stalin on 30 December 1949. The report was published in book form in 2005 under the title: The Hitler Book: The Secret Dossier Prepared for Stalin from the Interrogations of Hitler's Personal Aides. Linge died in Hamburg in West Germany in 1980. His memoir, With Hitler to the End, was published by Frontline Books-Skyhorse Publishing, Inc. of London in July 2009 with an introduction by historian Roger Moorhouse, author of Killing Hitler. Linge is portrayed by actor Thomas Limpinsel in Oliver Hirschbiegel's 2004 German film Downfall. In Hans-Jürgen Syberberg's Hitler: A Film from Germany (1977), he is played by Hellmut Lange. In the 1971 Eastern Bloc co-production Liberation V: The Final Assault, he was portrayed by East German actor Otto Busse. ↑ Linge 2009, p. 10. 1 2 Linge 2009, p. 20. ↑ Linge 2009, pp. 55-58. ↑ Hoffmann 2000, p. 56. ↑ Joachimsthaler 1999, p. 98. ↑ O'Donnell 2001, pp. 37, 125, 317. ↑ Linge 2009, p. 192. ↑ Linge 2009, p. 197. 1 2 Linge 2009, p. 198. ↑ Vinogradov 2005, pp. 53, 54, 110. ↑ Linge 2009, pp. 209-212. ↑ Otto Busse filmography. defa-sternstunden.de.